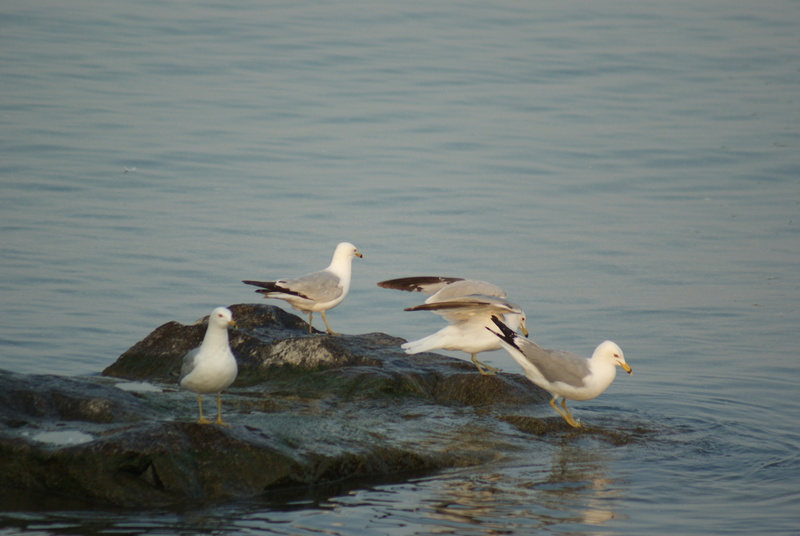 These Ring-billed Gulls are gathering on the shore of Lake Ontario. A gerund is a verb that functions as a noun or adjective. It has the suffix, —ing. Not all words ending in —ing are gerunds. Gender, in English, classifies many nouns as feminine, masculine, or neuter. Unlike many other languages, English does not change the preceding article to give every noun a gender. French and Spanish, for example, distinguish a gender for every singular noun. Nouns ending in —ess or [rarely] —ex are feminine, but are falling out of use. One problem in English is the lack of a neuter word for pronouns, forcing the awkward “they” to express the even more awkward “he or she” in sentences that are meant to be inclusive. Traditionally, the pronoun he represents “he or she”, and may still be used. When a child begins to use grownup words, he or she [they] may stumble on the pronunciation. Look for gerunds in a book or the newspaper. Identify whether they are acting as adjectives or nouns. Rewrite the sentences using verbs instead of gerunds. Take a sentence apart and identify all the parts of speech that you can.